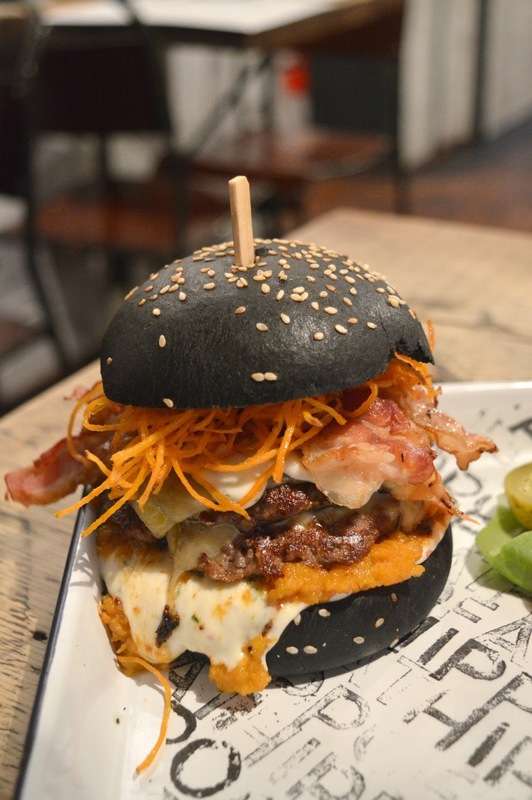 Fat Hippo celebrate every great event with a massive monster of a burger and Halloween is no different. 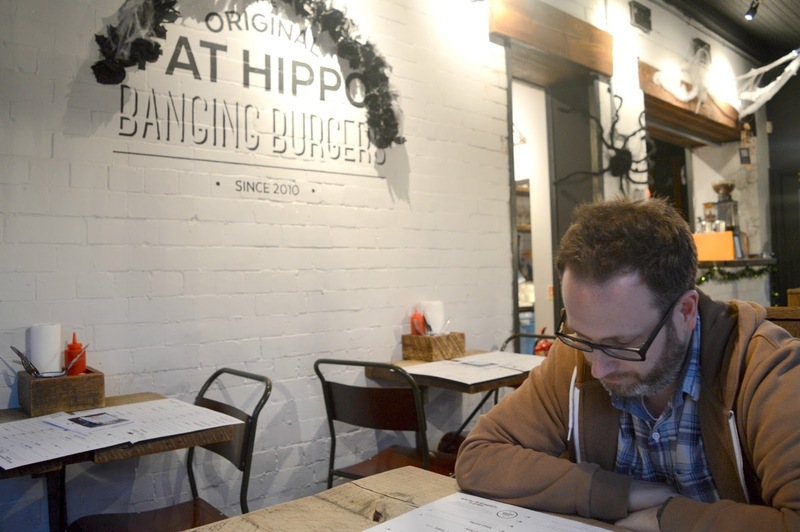 I found myself stalking them on social media for weeks in the hope of them revealing this year's Halloween menu and as soon as their "Hippoween" burger was announced I quickly booked us a table at their Jesmond restaurant on launch night. 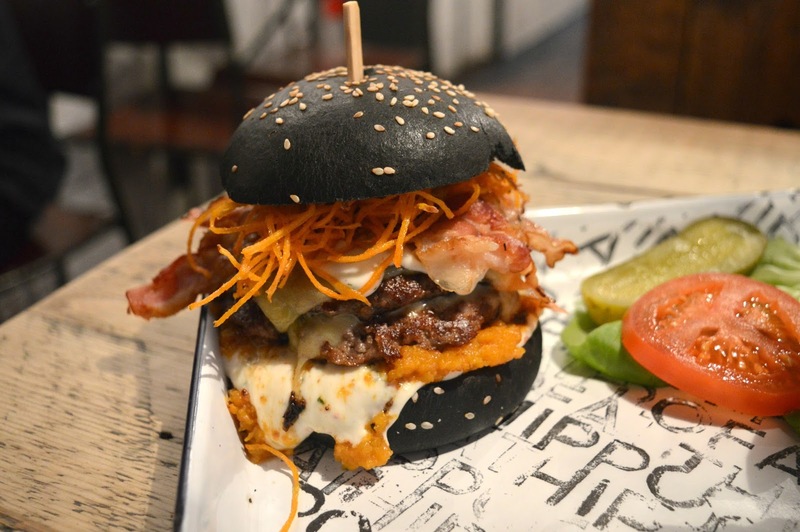 This year's Halloween Menu at Fat Hippo is created by the Burger Lab; Fat Hippo's team of burger loving experts who release a special burger each month that can be ordered for a limited time. It's the special burgers that keep me going back to Fat Hippo time and time again and the Halloween creation is always very special. 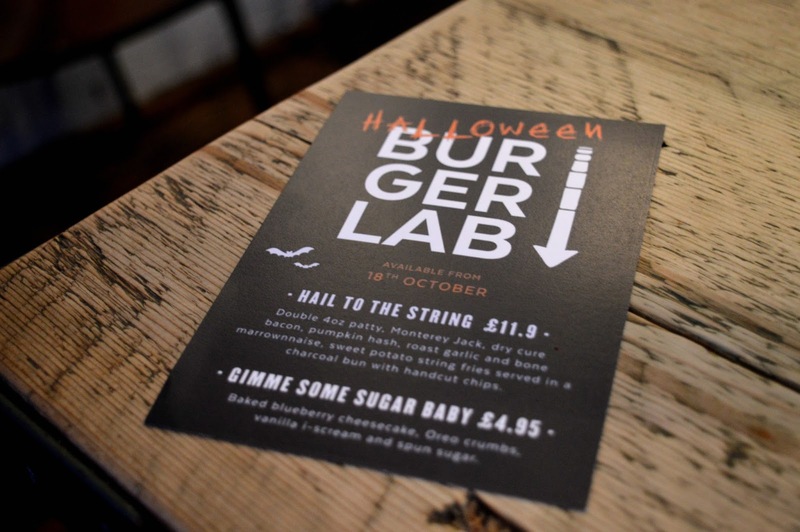 The Halloween Burger Lab have created two tempting dishes for the Toon's foodies, starting with the all important burger! 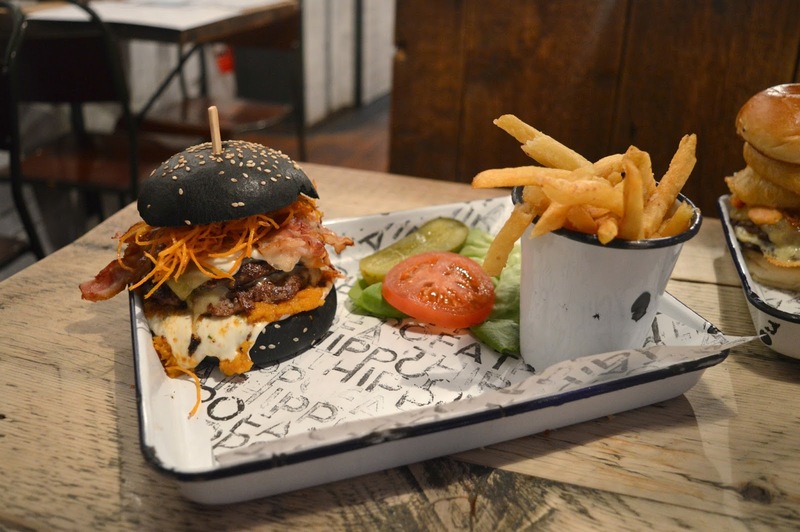 This year's creation is the "Hail to the String" (£11.90) - a double 4oz patty, Monterary Jack, dry cure bacon, pumpkin hash, roast garlic and bone marrownaise and sweet potato string fries all stuffed into a charcoal bun and served with handcut chips. Simon's decision finally made I eagerly awaited my Halloween treat, mouth watering at the thought of what was to come! Fat Hippo never fail to deliver something spectacular to the table and this year's Halloween creation is impressive. The Hail to the String is a thing of beauty! I loved the charcoal bun that gives the burger a fantastic Halloween look and with all the fillings spilling out this was a gruesome treat I couldn't wait to sink my teeth into. Every Halloween I find myself obsessed with pumpkin but as I'm way too lazy to purchase my own and go through the faff of pulling it to pieces and working out how to cook it I always go out of my way to devour as much pumpkin pie, pumpkin soup and of course the all important pumpkin spice lattes as I can find when I'm out and about. Pumpkin in a burger was new to me and I was so excited at how it would taste. The Hail to the String is lush! One of my favourite Fat Hippo burgers of all time - the pumpkin hash and roast garlic and bone marrownaise give it a beautiful seasonal taste and after I'd devoured it I realised that my mouth and hands were completely covered in so much messy sauce that I looked like an extra from a horror film. Don't bother splashing out on a Halloween costume this year, just eat one of these bad boys on your way to your party and you're sorted! As usual there was no room for dessert (let me know if you ever manage a dessert in Fat Hippo cos I will be seriously in awe!) which is a shame because there's also a special Halloween treat for those with a sweet tooth. The "Gimme Some Sugar Baby" (£4.95) is a baked blueberry cheesecake with Oreo crumbs, vanilla i-scream and spun sugar. It sounds amazing! We loved our Halloween date night at Fat Hippo and highly recommend you check out the menu! It's available now! That is one heck of an interesting looking burger .... I *think* it looks tasty but I can't quite tell!